Hey everyone, we’re down to less the 10 hrs before the supposed Mayan DOOMSDAY OOOOGA BOOOOGA! SO THQ/PCGamer/Nvidia is handing out keys for the steam edition of Metro 2033 <—- Click there for it. I’m not going posting till after Christmas so for some you there is a lucky break for you. In the interm though, I did hear recently from a friend I haven’t heard from after a few years. It is good to hear that he’s still among us out here, and has taken to getting out and having a social life and getting involved in the world. My hope is he’ll be getting back to the webcomic he’s authored. I think it could actually make a decent Graphic novel once completed. As far as the podcast goes its on Haitus till Jan 2013 for transition period and the fact that it is the christmas holidays. But we will pick back up around Jan 5th. We’ll have few guests on that show and I’m prety sure you will all get a kick out of it. Some musical cuts and voice actors galore will be part of the podcast off and on all 2013 and as always we promise to make them not only interesting but fun as well. Anyways, CH. 82 was indeed a laugh-o-matic chapter and we enjoyed reading several times and I have to say I almost blew chunks my sides hurt so bad from laughing, which hasn’t been that much lately. Ok everyone, this is me signing off the blog till 2013 and I hope everyone one and all has a decent Christmas spending time with the ones you love family and friends alike. And to those trolls out there, yea even you, have a safe, friendly holiday season and I know we’ll be seeing you as well in the next new year, but till then take care of yourselves and Happy Holidays to you from me. Greetings everyone, this is basically a shameful but much needed recruitment drive post for Genshiken fans! I’m a fan of slice of life anime and manga always have been to one sense or another. Bakuman, Otomen, Genshikn, Love dot com and related. 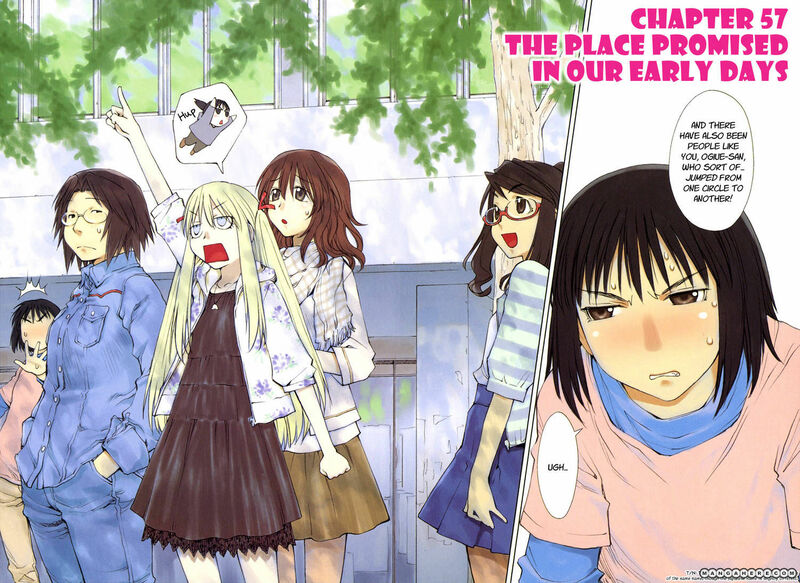 But none have reached more than Genshiken because it takes me back to my old days at SDSU and S.C.A.N. at Nastor Hall. Genshiken is Manga/Anime series that delves into the lives of one of the many types of circles (A University approved Group/Club in Japan) this one being for the visual studies of modern culutre. I always saw it as an Oasis for Otakus. A place where one can be creative with one’s self and related interests. Like Model bashing/casting/assembly, doujinshi writing and publication, cosplaying and costume design. Video Game programming and creation. Just to name a few. What Type of Genshiken Character would I be? What Genshiken character Persona am I ? Website: Genshiken on Facebook <— Come Visit us. Harunobu Madarame is not the leader of the Society for the Study of Modern Visual Culture. That honor goes to the mysterious “original president,” whose name and personal history was never really revealed. Madarame is however the closest thing to a driving energy behind the club. His fanboy does outdo that of any other members of the club. A Avid fanboy of anime, manga, and doujinshi from a very young age, Madarame does at times loudly defend his 2-D complex against anyone who tries to attack it. Once he gets in a ranting mood, he can be pretty hard to stop. He’s very intelligent, but sometimes that doesn’t quite come across through his lack of social skills. Doujinshi is Madarame’s particular weakness. OH and Madarame is SO not a Sou Uke! ARGH! Ok, so I’ve found out I won a 250$ Men’s clothing shopping spree from Schells WOO ME! I also just found out that since May 2012 Genshiken has returned! which is good, this is one of those few self-indulgence moments where you can say life is good and actually be truthful about it. I’m almost done decorating the section of the floor I call our Client support area. Cobwebs are up, save for one section, section left to spread around and a few odds and ends like dead zombie squirrels and mind controlled rodents. Also those that are following me that have an interest in Star Trek Online? I am also looking for some peeps to help form The Federation of Planets “501st Flotilla” . If there is anyone interested in laying into the borg and anyone else that would stand in the way of the federation, leave a comment with your steam contact and I’ll hit you up on steam and we go from there.